Your wedding day is a beautiful and special day for your whole family. At Seasons our professional and experienced Wedding Coordinator will work with you to plan the picture perfect custom wedding you've always dreamed of. 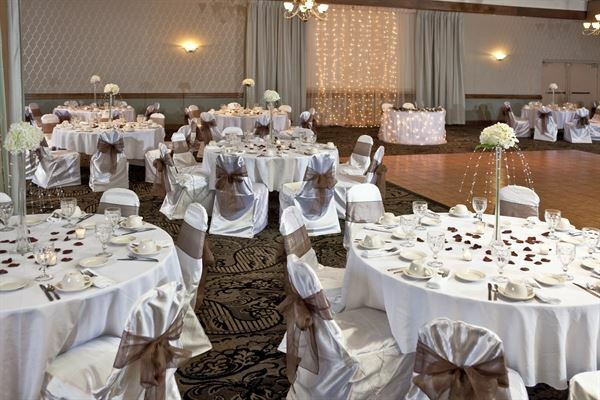 With more than 12,000 square feet of recently renovated flexible reception space, gourmet catering and banquet facilities, and one of Portland's largest ballrooms, Seasons Event & Conference Center is the perfect venue for weddings, banquets and receptions of all sizes. Looking for the perfect spot to hold a business event for a great deal? Look no further... We pride ourselves on great food and outstanding service. We are conveniently located right off of the Maine Turnpike and have plenty of free parking. Call one of our sales coordinators for more details! We look forward to hearing from you! All food and beverage charges are subject to a 20% service charge and 8% Maine State Meals Tax. The final guarantee of persons attending the events is due 3 days prior to the start of the event. The final guarantee may not fall below 80% of the contracted number of attendees. Should the guaranteed number of attendees fall below 80% of the contracted number - a penalty equivalent to the difference of the final guarantee and 80% will be assessed as additional room rental. Should the client fail to communicate a final guaranteed number of guests 3 days prior to the above function(s), the above Agreed number of guests will be considered the final guaranteed number of guests. The Hotel reserves the right to renegotiate meeting room rental charges if planned food and beverage functions are cancelled. Any functions with food and beverage canceled within 30 days of the event, may incur charges equal to the loss of food and beverage revenue for the event. We here at Seasons Event and Conference Center are ready to make your dream day come true! Take a look at our wedding packages for more information on pricing. Our menus are able to be customized to make sure that you get exactly what you want. Call our sales coordinators for more details! We look forward to hearing from you! The Grand Ballroom consists of the Cumberland Room, Oxford Room & Kennebec Room. Audio/visual equipment available: LCD Projector, Podium & Microphone, Television, Screens, DVD, Blackboard, Slide Projector, Flip Chart & Markers, Piano, Center Piece Mirrors, Copies, Fax, and any other audio visual requirements can be rented off site. Atmosphere/Decor: The Grand Ballroom has been recently renovated and has all new carpet, wall coverings, lighting and much more. Atmosphere/Decor: Newly renovated. All new carpet, wall coverings, lighting and etc. Great for small weddings, dinners, meetings or break out space. Special Features: 20 x 40 foot heated indoor pool, hot tub, fitness center, pets welcome with no advance notice, and complimentary 24-hour transportation to Portland International Jetport. A wedding, party and business center tucked away near the shores of Bauneg Beg Lake. Cater your own event or hire an outside caterer with the use of an optional commercial kitchen. Our tranquil lakefront grounds and wooded trails may be the perfect setting for your affair. A waterfront ceremony provides a beautiful backdrop for photos. Rustic lakefront cabins are also available for a weekend destination wedding. At Spare Time Entertainment Portland, we are all about FUN and specialize in memorable events. We offer an experience unmatched in the Portland, Maine area, with not only fantastic catering plus entertainment for your guests. Now booking for our new dining room, lanes, laser tag, and game zone! You can even rent the entire venue for a private experience for large groups of 100+. Our venue features a state-of-the-art Laser Tag Adventure- Take on your friends, family or co-workers in this laser battle zone. Groups of up to 24 embark on a 15 minute mission into our Fallen City. Each mission is sure to be a memorable, exciting, and competitive experience. Looking for a private experience? Check out our laser tag room available to host up to 25 guests for birthdays or group outings. Game Zone- Win points for amazing prizes on over 50 of the newest and most interactive games available, including The Walking Dead and Jurassic Park. Party Bowling Lanes- Our 22 regulation lanes offer fun for all, with food and bar service available from the outstanding City Sports Grille or a customizable pre-planned catering menu. Watch your favorite sporting events and music videos on our all new drop down movie theater screens. Play fun and cool interactive games on our new scoring system! City Sports Grille-Enjoy delicious American Fare in our elevated dining room and try our signature cocktails at the bar featuring several local taps. New exclusive catering menus available for all parties featuring our premium, best-selling cheese boards. Vegan/Vegetarian/GF menus available upon request, to accommodate all of your guests' dietary needs. We have several event spaces including our beautiful lounge/bar area, available to reserve privately by December 2018! Corporate events, holiday parties, team building outings, camp outings, Project Graduations, and so many other special events have a place in our beautiful new facility! Located on Riverside Street next to Allagash Brewery in Portland, Maine, just off of exit 48. Meeting and function space rentals are available for corporations, non-profits, government and public sector organizations, with preference given to those activities relating to the fishing industry. Our facilities are not available for religious or non-business related functions. Wireless internet is available at no extra cost. The board room is equipped with a state-of-the-art audio/visual projection system and teleconferencing equipment. There are sufficient tables and chairs in our conference room, but for larger events in the atria, rental of tables and chairs may be necessary. Restrooms are available on each of the three floors. Our building is equipped with an elevator, and all meeting and function spaces are wheelchair accessible. Looking to book our function space for an upcoming event, birthday, or celebration? Our club is a spacious facility with a vibrant, fun and modern decor. Complete with multiple bar options and easily adaptable to any themed event. The club has a full stage, sound and entertainment system for any band or performance. With a seated capacity of approximately 150 seated or 200 standing we can accommodate most any event. Portland's Italian Heritage Center is an elegant wedding and event venue. The Center is ideal for memory making and can accommodate almost any event from weddings and celebrations to school functions and business events. The beauty and functionality of our venue creates the ideal environment for your special occasion. Come and see the IHC Wedding & Events Center. We are conveniently located in Greater Portland, with ample free parking. Our rooms accommodate from 50 to 500 guests. Corporate, social and Wedding Receptions are our specialty. Nestled on the shores of Casco Bay and Garrison Cove on Bailey Island, Cook's Lobster & Ale House has become one of mid-coast Maine's most sought after event venues. Amazing views of the world famous Cribstone Bridge, breathtaking sunsets, casual, fun and an authentic Maine experience. Cook's Lobster & Ale House...where all great things come together for one amazing experience.